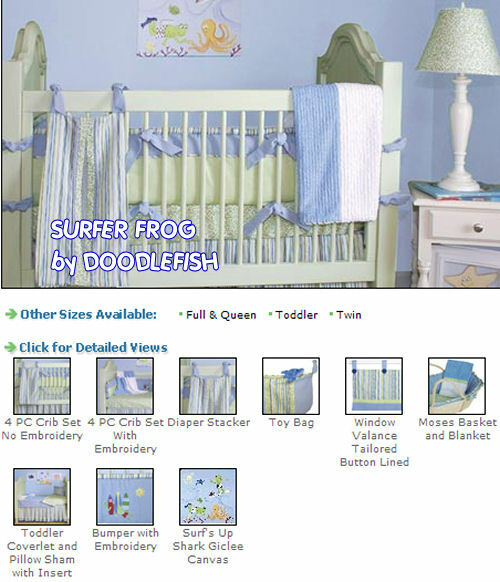 A surfboard theme is a popular variation of other water themed nurseries. I have designed several tropical surfing theme baby nurseries that started out as a basic beach themed room with nothing more than some plastic toys, rubber tropical fish and other decorations that were associated with an ocean vacation or fun at the beach. 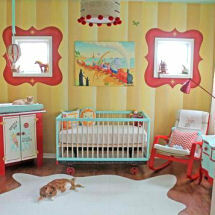 Modern parents jump in and decorate their babies' cribs and nurseries earlier than ever. Most nurseries are completely decorated by the end of the second trimester and by the time the baby girl or boy is ready to celebrate their first birthday, the theme needs an update if not an entire makeover. Theme rooms have pros and cons and one of the cons is that it’s easy to tire of a room full of tropical fish, frogs or turtles. But, on the other hand; once a beach lover always a beach lover. I was looking around for some cool tropical baby bedding fabrics with coordinating prints for the nursery window valance to update a baby girl’s Hawaiian theme nursery. I stumbled upon these cool surf theme decorations and accessories. The idea came to me that there are so many different styles of water sport decor that I can explore and a surfboard theme would be colorful and fun! They are all based on sea,sand and surf, but each has an individual twist. This is a big decorating bonus for professional decorators. We can easily transform one into the other without eating up a large amount of money. Parents will love a decorator who manages to give them cool surfboard theme nursery bedding and decor for a cheap price! In fact there’s no need to hire a professional decorator to give your little surfer boy or girl the surfing theme room of their dreams. Here are some ideas on how design a Hang Ten bed room for an inexpensive price. Colorful surfing print fabrics are available in lots of color combinations and will mix and match well with other tropical motifs like flips flops, hula skirts and seashells. You don’t have to buy fabrics with an obvious surfboard print for it to blend with your surfboard theme. Consider vintage Hawaiian print fabrics with hibiscus and other floral designs. Those prints will work well with the surfboards on the growth chart and other surfboard theme decorations and wall hangings! For more information on decorative surfing gifts and accessories for babies, return to Unique Baby Gear Ideas.